PHOTO: Allen Ramsey, DWCPhoto.com. Highlands senior center Evan Richardson (left) tries to fend off Woodford County's Trey Thurman (back) while teammate Nick Kendall (right) pushes for more yards in the first-round playoff win over the Yellow Jackets. Highlands takes on Dixie Heights in the second round at 7:30 p.m. Friday in Fort Thomas. District 5 came two points from a clean-sweep of District 6 opponents Friday in the first round of the Class 5A football playoffs. The District 6 champion Madison Southern Eagles (5-5 overall) needed a stop on a two-point conversion with 4:55 left in the game then to stand firm defensively in the last two minutes to beat the Grant County Braves, 28-27 in Berea. The Highlands Bluebirds (6-5) soundly defeated Woodford County, 50-14 while Covington Catholic (4-7) pulled away from Anderson County in the second half by a 47-21 count to earn the trip to Berea. Highlands hopes to continue to put players in positions to succeed. "It's not a decision that's made in one moment," said Brian Weinrich, Highlands Head Coach. "We watch them in little league football games. We watch them in middle school basketball. If they're in middle school, we get them in our off-season program. If they play on the basketball or baseball team, we watch how they stretch. It's a constant evaluation process. It's a bunch of coaches watching a bunch of guys every single day. Every once in a while, a coach will say so-and-so has a skill set to do this. We change positions. It's made a huge impact this season." While many fans may be eagerly anticipating a fifth consecutive CovCath at Highlands match-up in the region title game, the Bluebirds first have to take care of the red Dixie Heights Colonels (3-8) in a playoff rematch Friday at David Cecil Memorial Stadium at 7 p.m. The Colonels successfully ventured to Mount Sterling on Friday and beat the lone team in the region that had a winning record entering the playoffs in the Montgomery County Indians (7-4), 21-17. It did not help that the Indians played without junior running back Alex Harvey. Harvey rushed for 1,202 yards entering the playoffs. The Colonels were one of just two teams to go on the road and win in the first round of the Class 5A playoffs. The other team was District 7's third-seeded Lincoln County Patriots. The Patriots won at Harlan County, 40-35. "Our win against Montgomery County was a big win for the program," said Dave Brossart, Dixie Heights Head Coach. "We are very young and have endured several injuries this season. Our lack of depth and experience has been an issue all season. We have showed glimpses of playing good football, but our achilles heel has been playing four quarters of football. Versus Highlands last time, we played well for 2.5 quarters. We played Ryle last week tough for 3.5 quarters. Finally, we played a whole game and were able to upset a very talented Montgomery County team." Highlands handled the Colonels, 42-7 on Homecoming Night back on Oct. 9 in Fort Thomas. But the Bluebirds know the Colonels will come to town with confidence. Highlands led just 21-7 in the fourth quarter before scoring 21 straight to pull away. The Bluebirds recovered three Colonel fumbles and Bradley Greene intercepted a pass in the win. Greene also returned two punts for 103 yards to set up two of the late scores. Some teams have avoided him by punting out of bounds. "As a kicker, when you're told to kick it out of bounds, it's hard," Weinrich said. "As a kicker, you want to be able to just catch the ball and kick it. You often see teams screwing their kickers up when they do that, which is great for us. At the same time, I don't blame them because (Greene) has turned into a serious threat anytime he gets his hands on the ball." Greene has returned 15 punts for 295 yards and 11 kickoffs for 298 yards. That includes an 84-yard return on the opening kickoff against Grant County. "We must play great special teams and when you are lacking in depth, special team issues can result in giving up big plays," Brossart said. "We'll work hard at executing our special teams and try to win that portion of the game." Highlands ran the ball well against Dixie Heights going for 255 yards. Senior Nick Kendall led the way going for 115 yards on 26 carries and two touchdowns. Dixie Heights also rushed the ball well going for 255 yards. But the Colonels only entered the end zone one time when senior quarterback Gunther Faeth ran around the right side for a score in the third quarter. Faeth finished with 161 yards rushing on 17 carries. The Bluebirds enter the game hoping to stay on a role offensively in the vaunted Spread formation. They've hit the 50-point mark twice in the last three games. They are averaging 27.8 points per game and allowing an average of 26.5. Highlands boosted its average yards rushing per game to 170.3 after the 300-yard performance against Woodford County. Kendall has 879 yards rushing on the season on 161 carries for an average of 5.5 per carry. But Highlands has seen quarterback Austin Hergott in addition to juniors Grant Murray and Jared Pulsfort rack up big yards behind the Highlands offensive line led by seniors Bo Hebel, Nathan Raleigh, Carson Haas and Evan Richardson. Murray has 348 yards rushing on 46 carries with four touchdowns and Pulsfort has 52 carries for 314 yards and two touchdowns. "We just have to do what we always do," Raleigh said. "We just have to come to practice, work hard and prepare for whoever our opponent is. We're blocking a lot better. Before, it was one person messing up. We got that fixed. Now, everyone is doing his job. That's pretty much it." Kendall also leads Highlands with 23 catches for 143 yards and three touchdowns and senior TJ Sipple is second with 21 catches for 279 yards and a score. But sophomore Griffin Huber has emerged lately with 12 catches for 178 yards and a touchdown. Huber had three catches for 66 yards and a touchdown against Woodford County. Highlands quarterback Austin Hergott continues to show improvement passing the football. He has completed 110-of-203 passes for 1,280 yards, 11 touchdowns and 12 interceptions. "Their offense has changed a bit from week to week and I credit their coach for making improvements and utilizing their skill players," Brossart said. "But just like any other week, we have to play one play at a time, read our keys, gang tackle and fly to the football." Dixie Heights employs a 4-2-5 look defensively. Senior linebacker Noah Caple led the Colonels with 67 tackles entering the playoffs and junior defensive back Zachary Borchers had a team-high four interceptions. The Highlands 3-4 defense will again face the multiple Pro-Style Dixie Heights attack. Faeth handed off to junior Jose Torres a lot in the regular-season meeting. He also faked the hand-off then either kept it or threw in a few play-action passes. "We still haven't put together that four-quarter game we want to put together," said Shelby Jones, Highlands Defensive Coordinator. "We're striving to get dominant and dominate for a whole game. It doesn't matter who's in the game." Torres entered the playoffs still leading the Colonels with 758 yards rushing on 149 carries and five touchdowns. 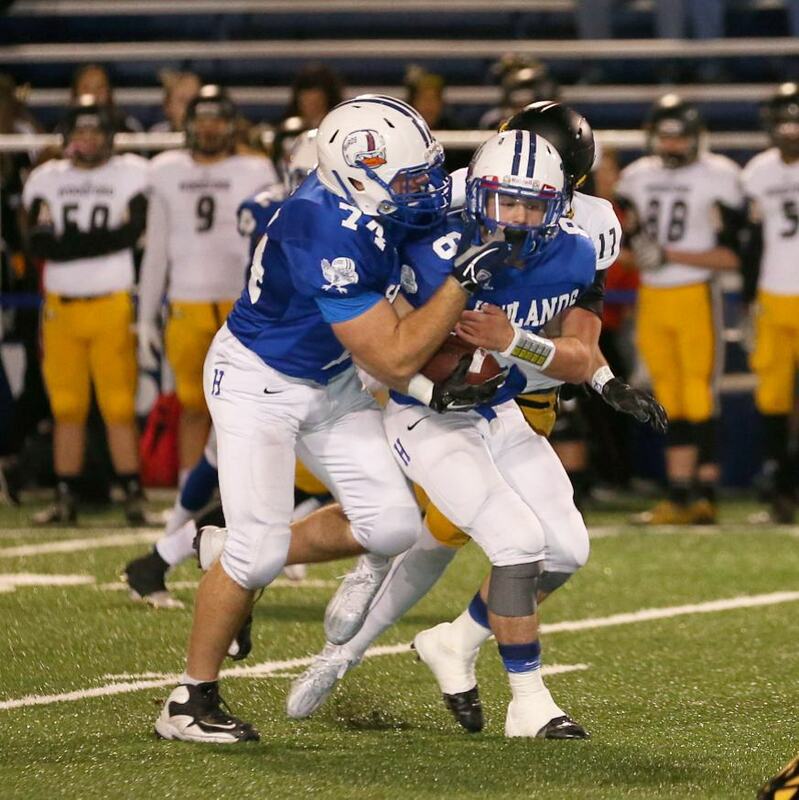 Faeth had 549 yards on 135 carries and five touchdowns. Faeth also completed 85-of-173 passes for 831 yards and six touchdowns during the regular season to go with three touchdown passes and six interceptions. His leading receiver was wide receiver Ethan Schulte with 31 receptions for 345 yards and a touchdown. Senior Austin Beal also had an interception against Woodford County. Beal and Greene have three each on the season. "I think if we do what we do, we'll be fine," Greene said. "We have a game plan every week. We just need to do what our coaches tell us to do." The Bluebirds did not recover any fumbles against the Yellow Jackets. But juniors Sam Taylor, Trey Bowden and Drew Bravard have two each. Highlands penetrated the Woodford County backfield well and will need to do the same thing Friday. Senior Tyler Robinson leads the Bluebirds with 10.5 tackles for a loss and senior Luke Lindeman has a team-high 5.5 sacks. Highlands is hoping to do what the 2009 and 2010 state championship teams did. That's beat Dixie Heights in both the regular season and the second round of the playoffs. The Bluebirds are 63-8 all-time against the Colonels. Highlands has won 12 in a row in the series dating back to Dixie's last win in 2002, 21-14 in overtime.